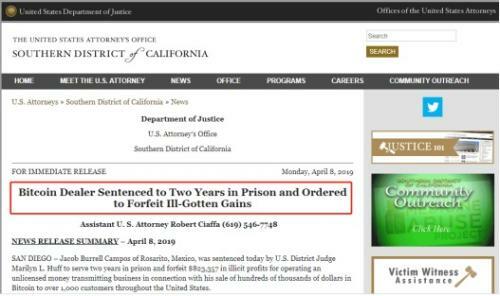 Recently, the California District Court announced that it involvesBitcoinThe case of money laundering. The judge sentenced bitcoin trader Burrell to two years in prison and confiscated illegal income 823357Dollar. Because he is engaged in unlicensed money transfer business, he sells bitcoin to more than 1,000 US customers, and the amount is hundreds of thousands of dollars. Trading Bitcoin is not allowed to be sentenced for 2 years? What is this operation? Is “anonymity, decentralization, and non-tampering” not the characteristics of Bitcoin? In this regard, the "Daily Economic News" reporter conducted an in-depth tracking. Judgment information shows that Burrell is a US citizen (has an important relationship with Mexico and has citizenship in three countries) and was arrested on August 13, 2018, and has not been released on bail. He pleaded guilty on October 29, 2018, acknowledging that he operated Bitcoin transactions without registering with the US Treasury's Financial Crimes Enforcement Network (FinCEN) and did not implement the necessary anti-money laundering safeguards. According to the plea agreement, in the bitcoin sale, Burrell promoted his business on Localbitcoins.com (a bitcoin over-the-counter trading platform) and communicated with his customers via email and text messages, often using encrypted applications. He is more than the currentexchange rateA 5% higher commission sells Bitcoin and personally accepts cash through ATMs and MoneyGram nationwide. Burrell admits that he did not conduct anti-money laundering or “know your customer” programs, nor did he conduct due diligence on the client’s funding sources. In the bitcoin acquisition link. Initially, he bought Bitcoin through a US-based regulated exchange, but his account was quickly closed due to a large number of suspicious transactions. He then moved to the Bitfinex cryptocurrency exchange in Hong Kong (to circumvent its authentication process), and between March 2015 and April 2017, he purchased a total of $3.29 million in bitcoin in hundreds of independent transactions. At the same time, Burrell admits that he will keep the US dollar cash in Mexico with the San Diego-basedPrecious metalTrader Joseph Castillo exchanged, and from the end of 2016 to the beginning of 2018, and other associates imported into the United States in small and multiple forms, almost every day, but each time the amount is slightly less than 10,000 US dollars, the total import value More than $1 million. Is “anonymity and decentralization” not the characteristics of Bitcoin? About the case, Professor of Central University of Finance and Economics,BlockchainDeng Jianpeng, a senior research expert in legal supervision, analyzed the reporter of “Daily Economic News”. “There is a strict anti-money laundering law in the United States. In addition, commercialization of Bitcoin requires obtaining a license, and the license is different depending on the state. When the American man provides a transaction, he must make a strict user identification based on the anti-money laundering law to understand the true identity of the other party, so as not to engage in some illegal activities such as money laundering, bribery, terrorist financing, etc. by buying and selling bitcoin. The man was found guilty of the legal basis." Along with the sharp increase in bitcoin prices in 2017, there are data showing that there are more than 20 million bitcoin investors in the world, and the number of Chinese speculative coins has exceeded 3 million. What is the current status of China's virtual currency sector? Will investors face such a sentence? In this regard, "Daily Economic News" reporter interviewedBank of China(Quotes601988,Medical stockXiao Xiao, director of the Law Society. “Suspects can put illegal income into banks or other financial institutions, convert these funds into virtual currency through virtual currency trading platforms, and then make various virtual currency-based transfers or purchases to cover up the real source of crime; or pass Some online platforms sell illegal goods or services to obtain virtual currency, and eventually convert these virtual currencies into legal tender. For example, the dark-net drug trading website that the media has exposed before, this website only accepts bitcoin, used to buy and sell various drugs, Guns and contraband, in order to circumvent the supervision of banks and the government. It can be seen that the risk of money laundering using virtual currency is very high, and it is necessary for the state to be vigilant." 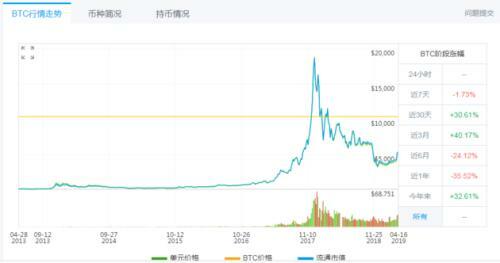 Regarding the legal risks involved in the investment of Chinese investors in virtual currency platforms registered abroad, Deng Jianpeng pointed out that the “Daily Economic News” pointed out that “on the one hand, China has banned domestic virtual currency transactions since 2017, so theoretically There is no virtual currency exchange. On the other hand, our laws and administrative regulations allow individuals to hold virtual currency and the freedom of trading, but it should be noted that current overseas exchanges provide commercialized virtual currency transactions to Chinese citizens, domestically. At the same time, foreign institutions should also make strict anti-money laundering mechanisms when they provide such transactions. Otherwise, they may violate China's anti-money laundering laws and even constitute crimes." Last October, ChinaCentral bankA new anti-money laundering regulation was introduced. On April 10, the 2019 Anti-Money Laundering Work Conference of the People's Bank of China was held in Xi'an. The meeting put forward a number of requirements, including the promotion of the anti-money laundering system, the establishment of a sound system as soon as possible for key and difficult issues and gaps; increased investment in resources and manpower, deep participation in international anti-money laundering governance, and better serve China's development strategy And once again reiterated the importance of anti-money laundering for our economic business. And virtual currency has such characteristics, how will the future anti-money laundering regulations fall in the field of virtual currency in China? In this regard, Xiao Wei said, "China can strengthen the supervision policy of virtual currency anti-money laundering, and incorporate the virtual currency payment represented by Bitcoin into the existing anti-money laundering and anti-terrorism financing regulatory framework; it can be collected through the real-name system. The identity of the payer is confirmed; the trading platform of the virtual currency also fulfills the obligations of customer identification, transaction record keeping and suspicious transaction reporting according to the requirements of anti-money laundering work; meanwhile, the anti-money laundering supervision of virtual currency should cooperate with foreign regulatory agencies. After all, virtual currency trading has the characteristics of globalization, and it is difficult to prevent and attack it by the power of one country." 04-10comment0A mining machine consumes thousands of kilowatt hours per month. The National Development and Reform Commission has ordered the elimination of "virtual currency" mining. 03-24comment0Beijing Mujin Association: Preventing illegal financial activities with virtual currency, etc. 11-10comment0Quest for "virtual currency" derivatives trading: Whose angel? Whose Satan? 7 When the stock market crashed, where did the evaporated money go?